Often with condition surveying we are also considering the amount of work required to repair, renew or upgrade and advising our customers accordingly. We are able to isolate potential issues and advise on appropriate remedies. The historical events leading up to the failure were established and method suggested to avoid future issues. 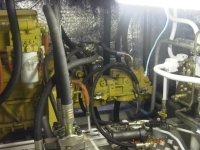 Overview of structural assembly, machinery installation, oil lubrication system, fire prevention arrangements, propulsion and steering machinery, general and emergency electrical systems, life saving equipment, corrosion prevention system and accommodation fitout. 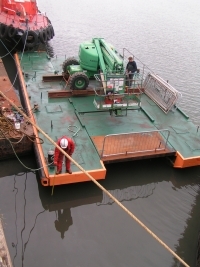 Hydraulic commissioning for main land and water propulsions systems as well as auxiliary hydraulic systems including a disability lift and lifting stairways. This large Jackup vessel being due for a passage through the Panama Canal required specialist mooring and towing arrangements. The vessel was surveyed for structural calculations with a revised bollard and chock arrangement. Additional structure was incorporated to reinforce existing arrangements and support new fit bollards and chocks to GL class approval. We were asked to overview the new build of a Jackup Platform after our clients were advised to seek advice on. After surveying the build in progress we identified several significant areas where the builders had not followed the drawings. After considering all aspects our re-design proposals were accepted by the builders, clients and MCA. Once prolific, now rare, we are often surprised at the how much work commercial tour operators are willing to undertake in re-building and converting WWII DUKWs to amphibious tour vehicles. 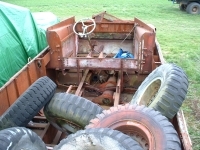 We have undertaken many surveys and condition reports of similar vehicles and can provide immediate feedback as to their suitability for re-build and conversion. 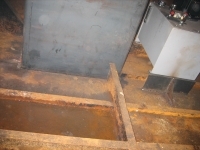 We were called in to survey this under performing new build vessel. We quickly identified these areas and established cause and remedy allowing the clients to concentrate on what needed to be done. 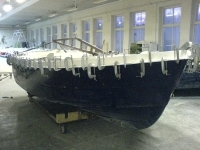 Issues with this vessel included propeller cavitation, vibration, noise, stability and in water speed, most of which were related to a severe lack of weight control during build. These findings lead onto a re-design project for future vessels. 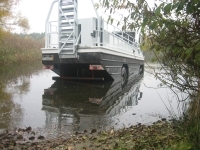 We were asked to overview the conversion of a pontoon after our clients were advised to seek advice. 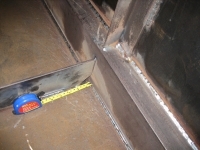 We quickly identified work that would cause structural failure rather than add strength and set in place good working practices that ultimately allowed the vessel to be MCA coded without further re-work. Systems commissioning on new build vessel. Duties included checking installations against drawings and specifications, running systems up and testing under variable loading conditions @ quay side and sea. A working knowledge of vessel systems as well as fault finding and fixing being essential skills for successful commissioning of vessels. 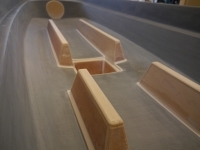 Dimensional checking of critical areas for a high specification coastal sculling boat, including slide seat parallel alignment, slope and height as well as critical rigger alignment.